, a scholar and poet of considerable merit, is said to have been the second son of the rev. Francis Thompson, B. D. of Queen’s college, Oxford, and vicar of Brough in Westmoreland, who died August 31, 1735, aged seventy. His mother, who died two years after, in the sixty-fifth year of her age, was the widow of the rev. Joseph Fisher, M. A. fellow of Queen’s college, Ox* ford, vicar of Brough, and archdeacon of Carlisle, by whom she had no children. Our author was born probably in the early part of the last century, but the year cannot be ascertained. He was young, when in 1734 and 1736, he wrote “Stella, Sive Amores, Tres Libri,” and “Six Pastorals,” none of which he thought it proper to include in his published works. In his poem, entitled “Sickness,” he laments the want of a mother’s tenderness, and a father’s care; but, as they died in advanced age, he could not have lost them before he had attained at least his twentieth year. It was on the banks of the Eden, which runs near Brough, that “his prattling muse was first provoked to numbers,” and where, we may suppose, he wrote most of those smaller pieces which he thought worthy of preservation. In these he frequently addresses an lanthe, who was probably a real mistress. At the usual age he went to Queen’s college, Oxford, and on February 26, 1738, took the degree of master of arts. He afterwards became a | fellow of his college, and succeeded to the livings of South Weston and Hampton Poyle, in Oxfordshire. 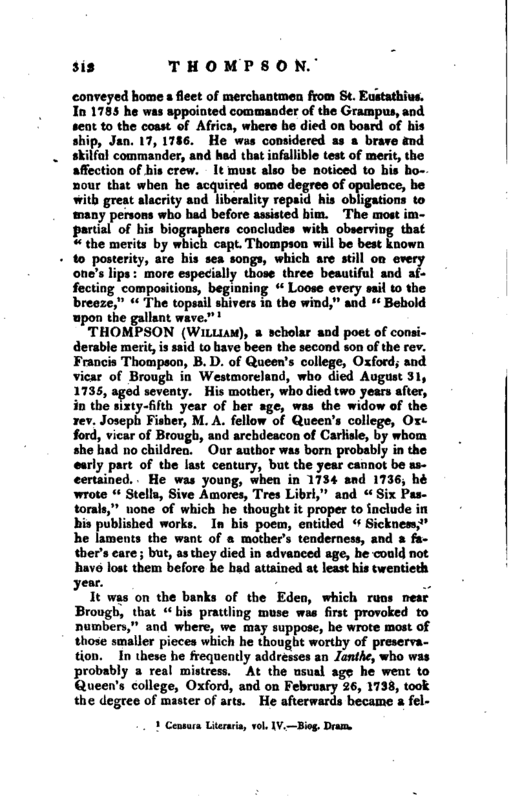 It was probably during his residence on his living that he published “Sickness,” in 1746. The origin of this poem may be found in a note subjoined to the fifth book, but much of it must have been written just before publication, as he pays tribute to the memory of Pope and Swift, who died about that time. In 1751, he is said to have been an unsuccessful candidate for the poetry professorship, against Hawkins. In 1756 he published “Gratitude,” a poem, on an occasion which certainly required it from every true son of Oxford. In the preceding year Henrietta Louisa, countess dowager of Pomfret, daughter of John, baron Jeffrys of Wemm, and relict of Thomas, first earl of Pomfret, presented to the university more than one hundred and thirty statues, &c. which the earl’s father, William, baron of Lempster, had purchased from the Arundel collection, and preserved at his seat at Eston Neston in Northamptonshire. On the 25th February, 1756, this lady received the thanks of the university; and the year following, the university celebrated a public enccenia, on which occasion, in an oration by Mr. Thomas Warton, professor of poetry, she was again complimented in the most public manner for her noble and generous benefaction. 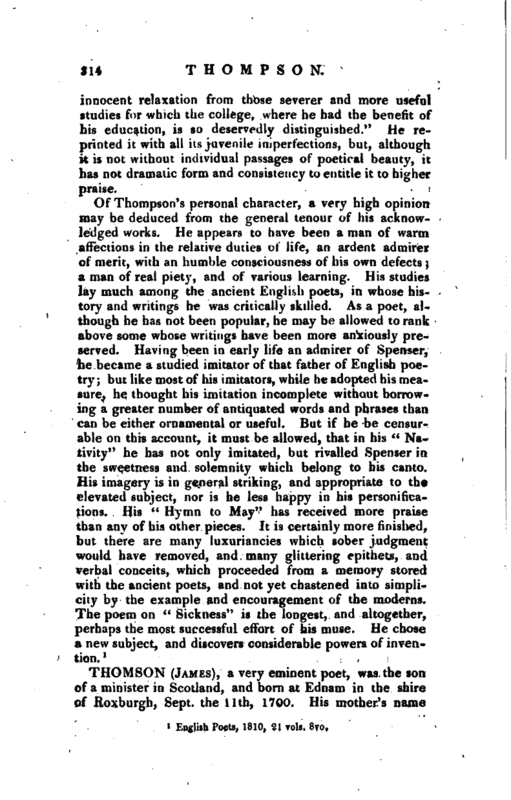 Besides Thompson, an anonymous Oxonian offered a poetical tribute to her liberality; and in. 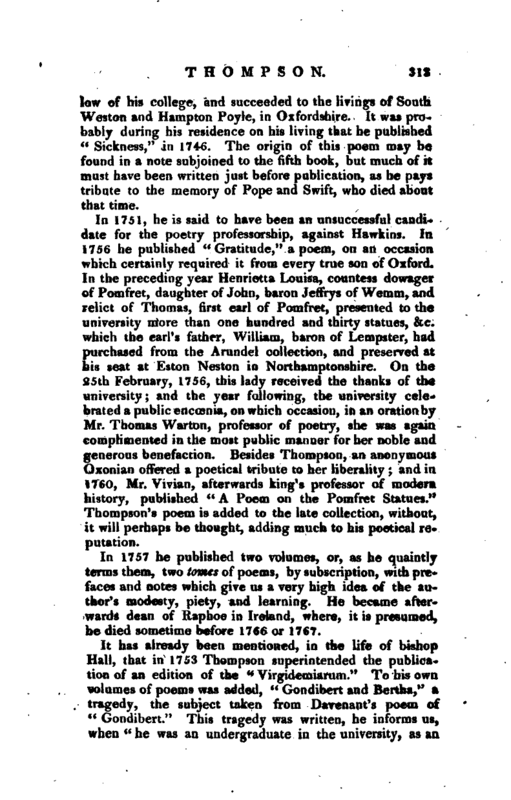 1760, Mr. Vivian, afterwards king’s professor of modern history, published “A Poem on the Pomfret Statues.” Thompson’s poem is added to the late collection, without, it will perhaps be thought, adding much to his poetical reputation. In 1757 he published two volumes, or, as he quaintly terms them, two tojms of poems, by subscription, with prefaces and notes which give us a very high idea of the author’s modesty, piety, and learning. He became afterwards dean of Raphoe in Ireland, where, it is presumed, he died sometime before 1766 or 1767. It has already been mentioned, in the life of ’bishop Hall, that in 1753 Thompson superintended the publication of an edition of the “Virgidemiarum.” To his own volumes of poems was added, “Gondibert and Bertha,” a tragedy, the subject taken from Davenant’s poem of “Gondibert.” This tragedy was written, he informs us, when “he was an undergraduate in the university, as an | innocent relaxation from those severer and more useful studies for which the college, where he had the henefit of his education, is so deservedly distinguished.” He reprintfd it with all its juvenile imperfections, but, although it is not without individual passages of poetical beauty, it has not dramatic form and consistency to entitle it to higher praise. English Poets, 1810, 21 vols. 8vo.